The Edward Searle (Pty) Ltd Group, originally established in 1896, are importers and distributors of medium technology industrial products, which are distributed throughout Southern Africa via a network of branches and regional distributors. The company has branches in Cape Town, Johannesburg, Durban and resident representatives in Port Elizabeth, Pretoria and East London. 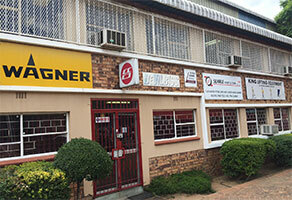 All these branches stock a range of equipment & spare parts and offer repair facilities. The SEARLE division is a specialist importer and distributor of leading technologies of spray painting and powder coating equipment. These products are supplied to the automotive manufacturing, truck and bus, refinishing, construction, general manufacturing, marine, corrosion control, aerospace, furniture, painting and decorative contractors, printing, road marking contractors etc. 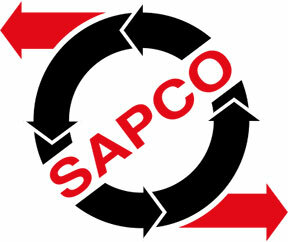 The SAPCO INDUSTRIAL division is a specialist importer and distributor of SANS compliant lifting equipment and heavy duty pneumatic tools. These products are sold to the automotive, petro chemical, construction, marine, offshore, mining, production and fabrication industries. Distributors and repair centers are located throughout Namibia, Zimbabwe, Mozambique & Botswana. Our Devilbiss range of spray guns have the ultimate in Transtech compliant technology air-caps for the ultimate industrial finish. Contractor and Line Marking Application equipment. The Wagner range of German contractor equipment is able to do it all. Engineered and developed to withstand the harsh South African operating environment. Prevent equipment failure and misuse with our high quality electronic or manual overload limiting systems. Compliant with the latest SANS 1638 regulations. Overload limiters fitted as standard. Yielding type SMART hooks with Forged heavy duty safety latches for use in harsh operating environments. ...a Black Economic Empowerment company, was founded in 2005 as a specialist, direct, importer and distributor of high quality, heavy duty, SANS compliant lifting equipment, pneumatic tools, spray painting & powder coating equipment; fluid handling systems. In accordance with the objectives of the Broad Based Black Economic Empowerment Act, certain of the long serving, senior male and female previously disadvantaged individuals in the Searle & Sapco Division of Edward Searle (Pty) Limited who have and continue to contribute to the efficiency of the business, have been recognised and appointed as shareholders, management and Directors of Searle Hoist & Tool (Pty) Ltd.
Management and staff will benefit further from education and skills training programmes whilst the resources, administration and general infrastructure of the major shareholder, Edward Searle (Pty) Ltd, will be available to and utilised by the Company. The Company is in the process of adopting a Black Empowerment Plan, which illustrates our commitment to the future economic development of Previously Disadvantaged Individuals. This plan will also include contributions to Community up-liftment programmes and socially responsible benefits for the staff and families of the Company.